Tired of dealing with heavy irons ? Of course you are! They hurt your wrist and make ironing a a distasteful chore! The DW2360 1700 Watt AccessSteam Iron by Rowenta is specially designed for ease and efficiency at the same time. This lightweight iron has microsteam stainless-steel soleplate with 300 microholes which allows perfect steam distribution. The temperature and amount of steam for a fabric is automatically determined by the auto-steam thermostat. The precision tip makes the most difficult to reach areas accessible and the vertical steam helps to remove the wrinkles from hanging garments to drapes. This 1700 Watt Iron includes an anti-drip system to help prevent spitting or leaking at low heat settings, a self-clean system that flushes out loose mineral deposits for long-lasting performance and clean steam , and 3 way smart automatic shut off for safety—the iron turns off automatically if left unused after 8 minutes in the upright position, or after 30 seconds in the horizontal position or tipped over. • Microsteam stainless-steel soleplate has 300 microholes for perfect steam distribution. • Precision tip reaches difficult areas like collars, seams and around buttons. • Vertical steam removes wrinkles from hanging garments and drapes. • Built-in Anti-Calc system removes impurities, ensuring long-lasting, clean steam. • Anti Drip system to prevent water leakage when the iron has not reached it’s optimal temperature. • Auto shutoff after 8 minutes if left vertical, after 30 seconds, if left horizontal or tipped over. • Self-cleaning system to prolong the life the iron. 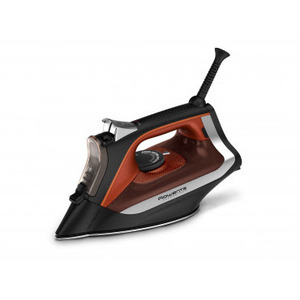 The hard water makes ironing harder as it leads to accumulation of loose mineral deposits on the inner surface of the soleplate which in turn compromises the steam output, but with the built in anti-calc system this iron takes care of the calc and gives you long lasting clean steam for perfect ironing. The anti-drip system prevents the water leakage when the iron has not reached its optimal temperature and the auto shut off helps to automatically shut off the iron after 8 minutes if it is left vertical, 30 seconds if horizontal or tripped over.